I was excited to come back to the Silhouette for this assignment to create a more polished card. 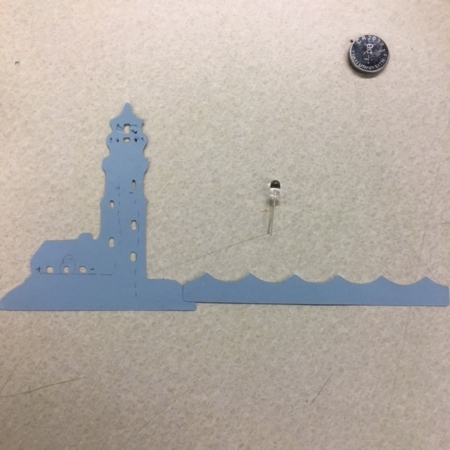 I knew I wanted the focal point of my card to be something that lights up in the real world, so I chose a lighthouse and opted for exposed LED bulbs in the cut-out windows. 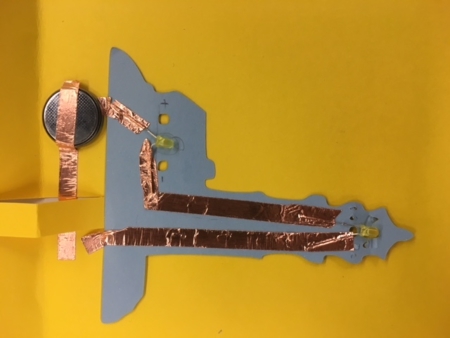 Fortunately, I have prior circuit experience from the labs in my major, so I was confident in my ability to design a series circuit in a custom shape. I’m a big fan of the ability to create flat, flexible circuits; I see paper circuits as a very versatile art tool. If I was teaching paper circuits, I’d be sure to emphasize the importance of LED and battery polarity. Reversed terminals can be a common pitfall for those with no prior circuit experience. I began by using the Silhouette to cut my pieces out of thin construction paper. Even with a high blade setting and low speed, I had some snags and ragged lines, so if I were to repeat this project, I’d slow down the speed even more. Then I traced a circuit path onto the back of my paper shapes. I wasn’t sure the flimsy paper could sustain the weight of the LEDs and copper tape, but I really wanted the exposed bulb in the lighthouse window, so I gave it a shot. To achieve the design I wanted, some circuit elements had to be at ninety degree angles relative to each other. I taped the circuit flat initially, then folded up the lighthouse vertically. I ran into a lot of frustrations once the circuit was assembled with a proper switch. 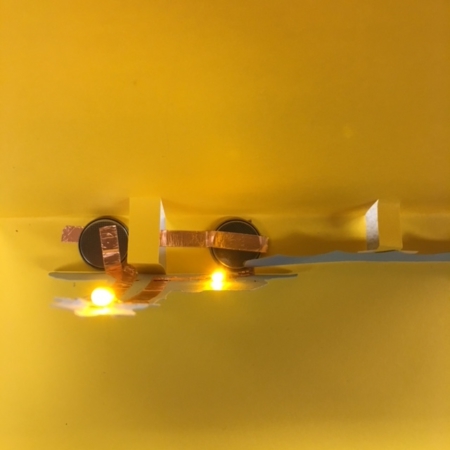 Although two yellow LEDs lit up perfectly fine with a single coin cell battery, the resistance of the copper tape in this circuit was too high. After connecting each LED to power individually to debug, I decided to add a second battery where the first switch originally was, and that worked perfectly! Special thanks to the fab lab employees for bouncing solutions around with me. With both LEDs lighting up perfectly, this project was finished. If I had more time to spend on this card, I would like to add more 3D elements and a message to the card, and also redesign the circuit so that the LEDs lit up upon opening the card. I’d love to spend more time on an elaborate, Silhouette-cut popup card. This project was fun to work on and I’m proud of the end result!